Despite silly rumours that Kanye West is still not finished his album, even though it will be out in a week, that didn’t stop him from having a listening party in New York City. The list of collaborators is now somewhat known, and it’s as impressive as you would think. Daft Punk, Justin Vernon from Bon Iver (again), Chief Keef all appear, with Rick Rubin as the executive producer behind the whole thing (via Billboard). For fans of Daft Punk, you will be excited to know that they worked on three or four tracks with Yeezy. This could be a good one. As widely expected, Apple announced their iTunes Radio music streaming service. All those iRadio rumours for the name were slightly off I guess. iTunes Radio has some sort of mind control device, as the more you listen, the more it will customize the songs to your liking. Too bad I’m only going to listen to The Macarena on loop! Oh wait, I can’t even listen because I live in Canada. The service is car-friendly, in that voice dictation service Siri will take your requests. Good luck getting her to play the band !!!. The service is freeeeeeeeee for all users, as it is ad-based. But if you have iTunes Match, you won’t have ads. Cross-promotion! Apple also announced a new operation system, iOS 7. People are going crazy because it’ll be ‘flat’, which is interesting since it’s on a two dimensional device. That about ends my knowledge of iOS 7. If you go to one festival solely because of the poster, let it be Festival Supreme. The Tenacious D duo of Jack Black / Kyle Gass not only have an awesome festival, but they curated a festival that contains both comedy and rock. The event is October 19 in Santa Monica, California, and will make you laugh until you pee your pants like I did while I slept last night. 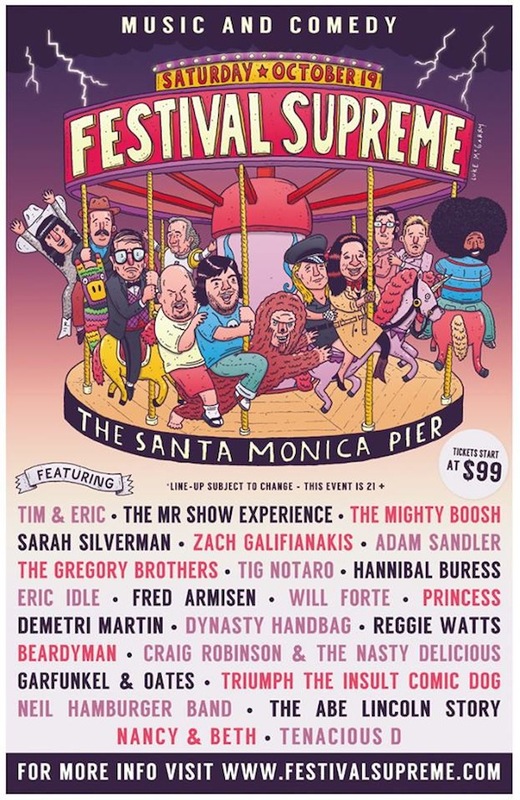 We will get big names like Adam Sandler, Sarah Silverman, The Mr. Show Experience, Tim & Eric, Eric Idle (who I really should’ve listed first), Demetri Martin, Triumph the Comic Insult Dog, and a bunch more awesome acts. Check out a trailer below. As Torontonians gear up for Friday night’s free show by The National at NXNE (and oh hey, we have a preview of it), you can watch a performance of four songs off of new album Trouble Will Find Me. But not just any performance, it’s an acoustic performance in the cramped offices of NPR, as part of their Tiny Concert Series. Watch the band play This Is The Last Time, I Need My Girl, Pink Rabbits, and Sea Of Love.